BioWare's co-founder says The Old Republic is actually almost too successful right now. Greg Zeschuk thinks that Star Wars: The Old Republic will do just fine, despite digital sales of the game being limited to EA's Origin service. He says that Origin is "pretty slick" and that the game has reach it needs, even without other online retailers. 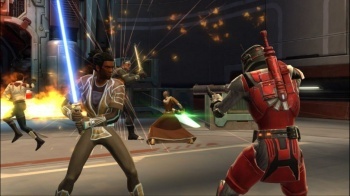 If anything, Zeschuk thinks that The Old Republic will do almost too well, and that if people don't hurry, they might not be able to play at all when the game launches. "We're going to be at capacity," Zeschuk said. "we're telling people is that if you don't pre-order a copy you may not even get in in the first month just because there's so many people on the servers that if you don't get it you may not play for a while." BioWare and EA have admitted that they are deliberately capping the capacity at launch however, so whether it should really be used as a metric for success is debatable. Zeschuk is a high-profile EA employee, so it's unlikely that he's going to turn around and say anything bad about Origin. That said, it's unlikely that Origin will actually be bad, at least, not if EA really wants to compete against the likes of Steam. Unfortunately, it seems that Origin has something of a curious streak, by which I mean that the terms and conditions give it permission to mine your computer for information and sell it to advertisers. That's going to put some people off, no matter how good The Old Republic actually turns out to be.